Citizen Scientists: Be a Part of Scientific Discovery From Your Own Backyard, by Loree Griffin Burns. (Photographs by Ellen Harasimowicz.) Henry Holt, 2012. 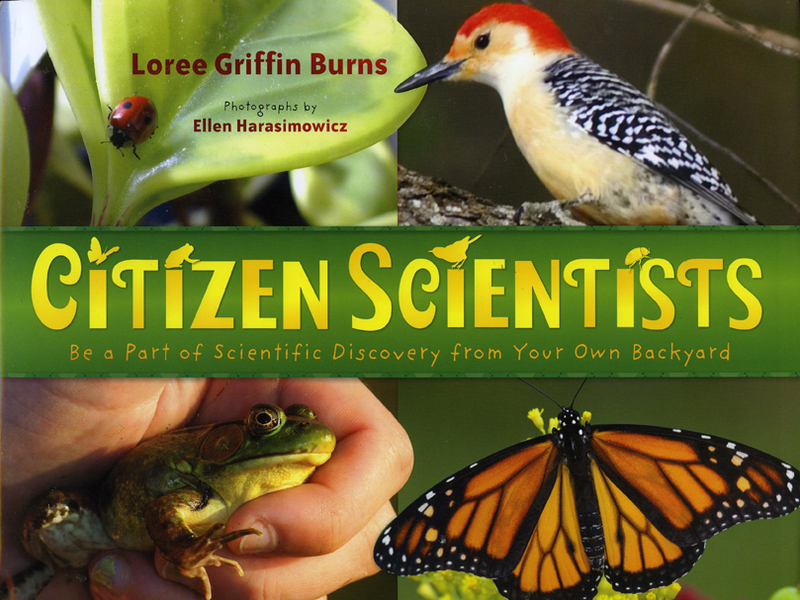 With informative and engaging text and high-quality photographs, Citizen Scientists introduces children (and adults) to four projects in which participation of ordinary people is part of important research. The projects profiled are Monarch Watch, in which citizens catch, tag, or report information from tagged butterflies; the Audubon Christmas Bird Count in which citizens count winter birds ; Frog Watch which involves listening for frog and toad calls; and Lost Ladybug in which citizens help chronicle ladybug abundance and diversity. Each chapter describes the project and its importance while reporting on the experience of young people who are participating. There is much information about the butterflies and birds, frogs and ladybugs throughout the book. This is a science book that will definitely lure in young readers and will leave them anxious to participate and be informed about these creatures that for the most part live right in our backyards. Loree Griffin Burns reading the first chapter from her book, Citizen Scientists. Loree Griffin Burns speaks about Citizen Scientists as part of the AAAS Video Book Talks.